By now, you probably already know the benefits that PPC advertising can have for your business and online sales. However, running PPC campaigns for your business can result in high spend and weak results if you don’t know what you are doing. When it comes down to it, you need to ensure that your campaigns are set up and running efficiently, without wasting any money to maximize overall value for your online marketing efforts. There is a lot of competition out there to attract and convert the same customers who you are looking to capture through PPC ads. Since you work in a competitive market with a limited budget, small staff, and limited time, you need to make sure that each PPC campaign is efficiently and converting. PPC advertising is numbers and data-driven digital marketing channel, so you can use stats to provide accurate insight into the health of your PPC campaigns. Understanding your PPC data is essential to drive sales, but you also need to know what to look for and how to optimize your campaigns based on your PPC advertising data. Keyword optimization is the act of researching, analyzing, and selecting the best keywords to drive qualified traffic through Google AdWords and other Pay Per Click platforms. Keywords are the way you help Google connect your products and services with your customers since your audience will use specific keywords based on their search intent. Different types of keywords signify different levels of intent throughout the entire Customer Journey. This means keyword research is a critical aspect of PPC advertising. PPC keyword research is something that you do throughout the whole lifespan of a PPC campaign because you will be refining your keyword selection based on changes in your products and what your customers are searching for. Restrict wasted ad spends by using negative keywords. Add negative keywords by reviewing your Search Query Report and add keywords to your negative keyword lists if you see low conversions or irrelevant searches. Delete any keyword that has less than 1% CTR after 200-300 Impressions. Build particular ad groups for keywords that are converting. This reduces competition among lower performing keywords, so your lucky keywords can help increase conversions. Ads are among the most important “human element” of a PPC advertising campaign because this is the content that your audience will read. 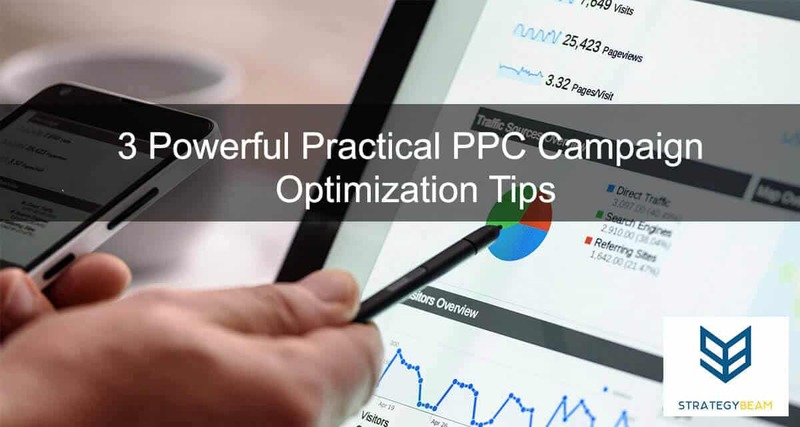 Optimizing PPC ads will help you not only produce more engagement, but optimized PPC ads will also drive more qualified searchers who have a higher chance of converting on your website. Continual ad optimization will ensure that you will accomplish your business goals through relevant content for your audience. As you continue to optimize your PPC keywords, you should work to integrate your keywords into your PPC ad text to increase CTR and Quality Score. Including your keywords throughout your ads in a natural manner will help Google understand how your keywords and ads are related, so your PPC ads will show to searchers interested in your products and services. A strong Call To Action (CTA) will help connect your PPC ad to get your readers to click and convert on your landing page. Conversion Rate is the most important metric to watch as you optimize your PPC ads, but also pay attention to CTR, Impressions, and Clicks. These metrics will help you understand opportunities to improve existing ad copy. As you look to improve your ads, just remember that you don’t have to reinvent the wheel. Include keywords from your ad groups in the Headline and description copy. I also recommend using your keywords in the Paths when possible. Always Duplicate ads and pausing the original ads when updating ad copy. This will retain historical data for how the original ads. Each ad group should have 2-3 ads in each, with text variations at all times. While landing pages are not a direct part of your PPC campaign, they play an integral role in the overall Cost Per Click and Conversion Rate of your campaigns. Landing page optimization is vital to PPC, because landing pages are one part of your PPC campaigns that you have complete control over. It is your job to optimize your PPC landing pages to tell your readers about your products or services to drive conversions. PPC ads can influence how your landing pages are designed because you want to keep messaging consistent across your keywords, PPC ads, and landing pages. There are many ways to optimize your landing pages, but there are a few tips specific to PPC campaigns. Try to keep the ad headline the same as the landing page headline. This will keep messaging consistent for your audience, and Google will know that the keywords are relevant to your campaign. Make sure that anything you promise on your PPC ads is fulfilled on your landing page. For example, if your PPC ad offers a free trial, you should include the same text at the top of the page. Always adjust PPC copy and landing page copy at the same time. Since the landing page and PPC ads are essential elements for Google to determine the Quality Score, you want to ensure your message is consistent. PPC advertising can be a powerful and highly profitable part of your digital marketing strategy. However, if you are not careful to balance and optimize your PPC campaigns, then you can waste a lot of money. The best way to ensure that your business is driving quality traffic through PPC ads is to optimize the three most important elements of your PPC accounts like keywords, PPC ads, and landing pages. Let’s talk if you are ready to bring your business to the next level through professional PPC management. Our team of experienced PPC managers will work with you to drive sales and online conversion through optimized Pay Per Click ads for your business. Shoot us an email today so we can cooperate with you and help you make more money!